Once preliminarily qualified, the client will enter into a retainer agreement with Cold Spring Advisory Group and remit the agreed upon consulting fee. Cold Spring Advisory Group is now officially under contract and will be your consulting firm to perform a full case analysis. A detailed analysis of your investments and portfolio is conducted to determine the details that facilitated your loss, a clear calculation of damages and potential broker liability. 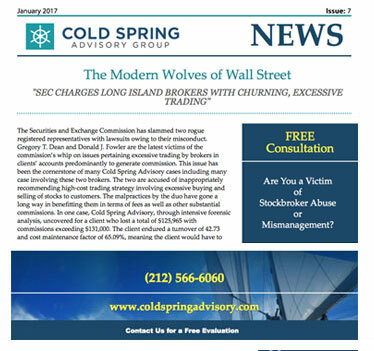 Cold Spring Advisory Group will conduct an in depth review of all trading statements, new client application forms, risk disclosure statements and letters and communications between you and your former advisors. In many instances we may suggest joining a group of other investors with similar claims against the offending broker and/or firm to bring a group claim. Cold Spring Advisory Group will provide a detailed report to the attorney handling the case pointing out various nuances of your case which should be highlighted to the offending party and the arbitration panel. Through our secure website you will be able to track the status of your case without waiting for updates from your attorney. Furthermore, if you need to provide any information necessary to assist in the prosecution of your claim you may do so without time consuming phone calls or in-person meetings.